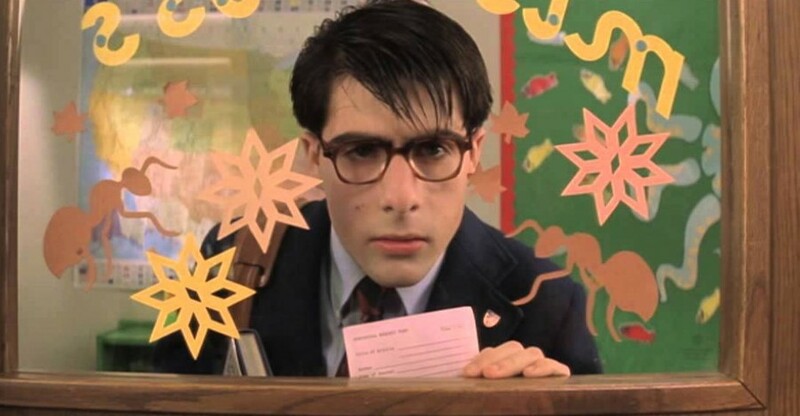 Jason Schwartzman as Max Fisher in "Rushmore"
Rushmore Academy was where Wes Anderson went to school. Well, not exactly – it was called St John's School, and it was only after he scoured private schools as far as the UK that he realised his alma mater was the perfect setting for his semi-autobiographical movie about a precocious turd who forms extracurricular clubs and falls head over heels for a hot school teacher. In a very Anderson-y way, he banked his private school experience for Rushmore. Like Rushmore's main skeeze Max Fisher, Anderson, too, was academically underachieving and had a throbbing crush on an older woman. Released in cinemas 16 years ago this year, Anderson's sophomore effort was Jason Schwartzman's big screen debut. Here, Schwartzman – who plays an entitled, snobby writer in Listen Up Philip, out this Friday – gives us the untold story of the making of Rushmore. “I was 17 and I lived in LA and there was a party. My grandfather was a composer and he had done the score for the movie Napoleon. In Northern California, there was an event where they played the movie and had a live orchestra play his score. At the last minute, I went. I rented a tuxedo with tails and I had a cane because I was kind of a clown. This woman named Davia Nelson was doing the Northern California casting for Rushmore. Davia was talking to my cousin, Sofia (Coppola), and she said, ‘I’m trying to I’m casting this movie called Rushmore and we are looking for a 15-year-old teenager who is a playwright and in love with this older woman.’ Just the summer before, I had written a play and directed it and I was in love with my nanny, like deeply. And Sofia said, ‘Oh, that's funny. That sounds like my cousin, Jason.’ She pointed to me and I’m wearing a tuxedo and tails it was just a fortuitous type of weird lucky moment. “When I read the script for Rushmore, that was the first time I really feel like I locked into a movie. I had an appointment on a Friday. I skipped school and made my own outfit to wear to the audition. I just remember meeting Wes and immediately feeling not as nervous as I was because he was younger than I thought he was gonna be. He also had these Converse sandals and I had green New Balances with bright red reflectors and I remember there being instant admiration for each others' footwear – maybe that was on purpose on his part to kind of settle me. For reasons unknown, someone known only as Ryan appears in almost every scene of Rushmore and clocks more screen time than Bill Murray. Keep your eyes open for his cameos. Shame he didn't win Best Supporting Actor. Next time, Ryan, next time.